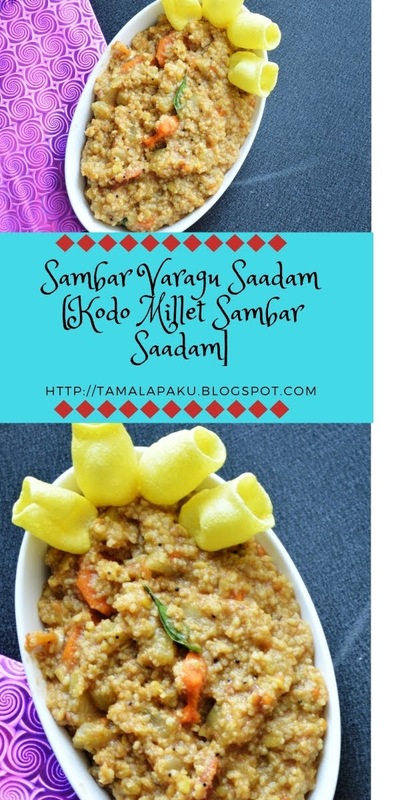 For the letter S I have made sambar saadam using another millet called Kodo Millet. It was a breeze to prepare this in the Instant Pot. The same can be prepared using a regular pressure cooker. 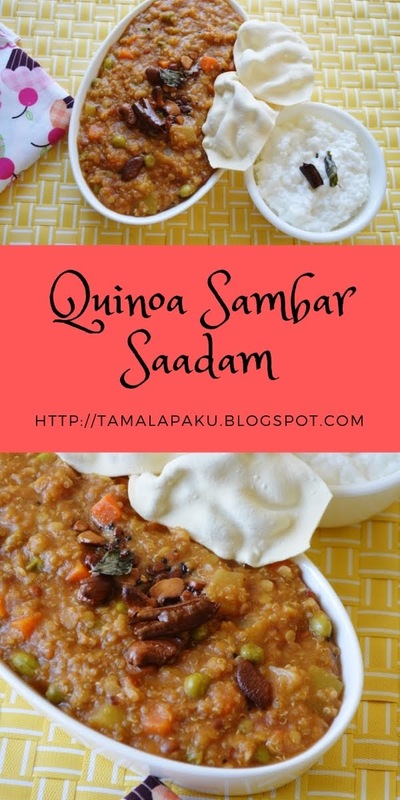 I prepared the tadka separately after the sambar saadam was done as we love the crunch of the dals in the tadka. If I am in a hurry I first do the tadka in the pressure cooker, add the dals, vegetables and spices. And just serve after it is done. Wash and soak Kodo Millet / Varagu / Arikelu for a few minutes. Ideally 2-4 hours. But I never soaked it for more than 15 minutes. Wash toor dal and set aside. In the IP inner pot, mix kodo millet and toor dal. Add in the chopped vegetables salt, turmeric, red chili powder, jaggery, sambar powder and about 2 cups of water. Set it to Pressure cook or Manual Mode for 10 minutes. Upon release of pressure, prepare the seasoning on the stove top. In a heated pan, add the oil and mustard seeds. After the mustard seeds pop, add chana dal, cashews, curry leaves and hing. After the chana dal and cashews are golden brown, remove and transfer into the cooked millet-dal mixture. Mix well and serve with an accompaniment of your choice. 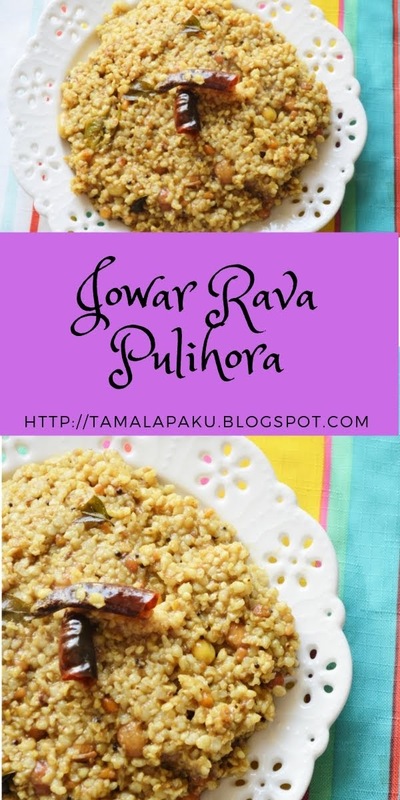 For today I have a classic pulihora recipe from my home state. I already made a different version here. This is a No Onion No Garlic recipe and is suitable for festive occasions as well. I made the gongura mix a day early, refrigerated it and used it on 2-3 occasions as needed. Cook the rice separately and spread in a serving bowl to cool. Pick the leaves without the stalks and wash them thoroughly. In a heated pan, fry chana dal, urad dal, coriander seeds, mustard seeds, fenugreek seeds and dry red chillies until they are just brown. Keep aside to cool. Powder all of them and set aside. In the same heated pan, add a teaspoon oil, fry the gongura leaves and green chilies until they become soft and mushy. Grind the wilted gongura leaves, green chilies and tamarind. Add in the spice powder from step 3. And give them a good mix so the powder mixes well with the gongura paste. Chana Dal, Urad Dal, Cumin Seeds, Mustard Seeds, Red Chillies, Curry Leaves, Asafoetida and Peanuts. After the mustard seeds crackle and the dals are golden brown, add the gongura paste, add in the salt, turmeric and mix well and remove from heat. The gongura pulihora mix is now ready. Mix it in the cooked rice. Serve it as part of a meal. When doing an alphabetical series, Q is typically one of the most difficult letters to come up with a recipe for apart from X. But this time Q for Quinoa was easy to figure out. I had given up on quinoa for a while as my stomach was not reacting well to it. But my sister suggested that I should soak quinoa for a few hours before using it and that has made a tremendous difference. This one pot meal is an easy to make and quite filling. I served it with papads and Little Millet Curd Rice. Wash and soak quinoa for a few hours (Optional). Wash the toor dal. Grind the ingredients listed under 'To Grind' and set aside. Power the Instant Pot, making sure the inner pot is in place. Set it to 'Saute' mode. Saute the mixed vegetables for a minute or two. Add the drained quinoa and toor dal and about 2 1/2 cups of water, the tomato-masala puree from step 2. Sprinkle salt and turmeric. Mix well. Put the Instant Pot lid on. Cancel the 'Saute' mode. Set it to 'Manual' or 'Pressure Cook' mode for 12 minutes. Allow it to naturally release the pressure. Open the Instant Pot lid, and if the seasoning was set aside, add the seasoning and mix well. If the consistency needs adjustment, put the Instant Pot on 'Saute' mode and let it simmer for a few minutes. Unplug the Instant Pot. Serve hot with extra ghee and papad. For the letter P here is a simple yet flavorful rice which can be put together in a few minutes if the rice is ready. The addition of the sesame powder in addition to the Vangibath Powder is the highlight of this quick fix. I had initially planned a Paneer Tikka Pulao, made and clicked as well but the pictures came out so bad (due to some accidental change of settings) that they were unusable. So I had to use this rice dish from my drafts. Cook the rice so they are fluffy. Spread the cooked rice in a wide serving platter to cool. Roast and grind the ingredients listed under the same heading and set aside. In a heated pan, add oil and the seasoning ingredients. After the mustard seeds start crackling and the peanuts are golden brown, add chopped onion and saute them until translucent. Add chopped tomato and peas let them cook for about 4-5 min. About about a tablespoon of water if needed. Add chopped turmeric, green chillies, peanut-sesame seed powder, vangibath powder and mix well. Add salt and mix for a couple of minutes. Add in the cooked and cooled rice. Mix well and adjust the flavor. If the tomatoes are not too sour, squeeze some lime/lemon juice. This is a good stomach cleansing rice dish. Our elders have always turned to Omam/Vaamu/Ajwain for any digestive disorders in our growing up years. So I am actually not surprised to see it being added in a rice dish. When I first saw this recipe on a TV show, I felt it was just a glorified version of the humble lemon rice. But since I had no other brain wave to go with the letter O, I decided it give this one a chance. Oh Boy! I was so wrong in my assumption. 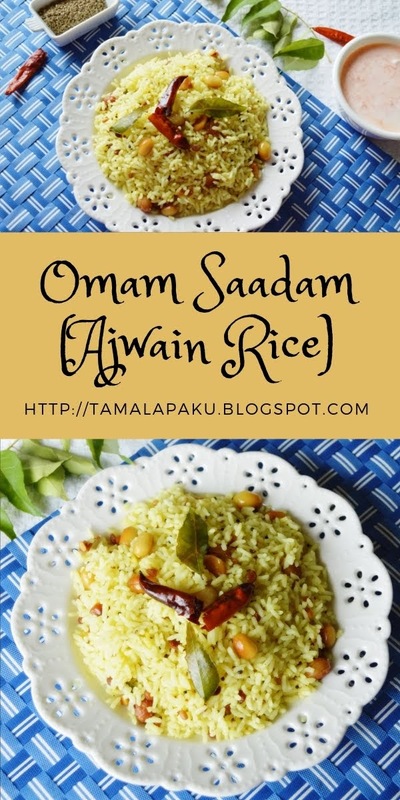 With the addition of Ajwain, the rice just got a huge lift in flavor so much so that my lemon rice loving husband said that I should henceforth always add ajwain to the lemon rice ! This rice is a flavorful addition to the dining table or lunch boxes. Cook the rice and spread in a wide platter to let it cool down a little. Meanwhile in a heated pan, add ghee/oil and add the seasoning ingredients. After the dals are brown and the mustard seeds have crackled, add the turmeric, ajwain and garlic. Mix well. Add salt and the cooked rice. Mix well and remove from heat. Squeeze the lime juice and mix well. Set aside for a few minutes for the flavors to blend in. Serve it with Raitha and/or buttermilk. Here is a super easy and flavorful rice with the goodness of sesame seeds. 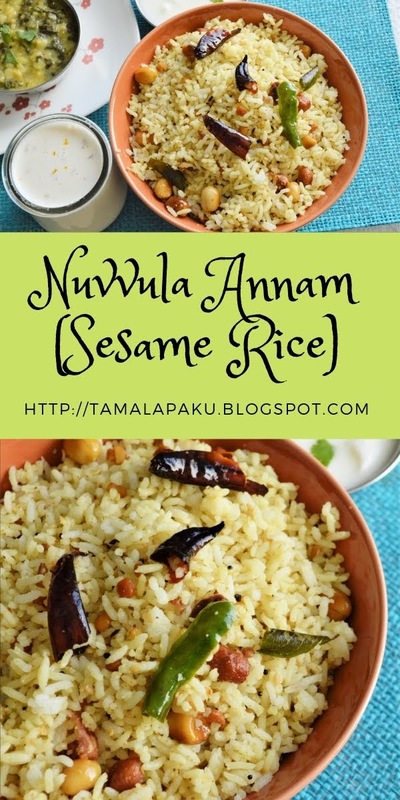 The sesame seed powder can be made ahead and this rice works very well with leftover rice and makes a great lunch box dish too. Cook the Rice so that each grain is separate and not mushy. Spread the cooked rice on a wide platter and allow to cool. Roast all the ingredients one by one in a heated pan. Set aside and allow them to cool. Grind them to a fine powder upon cooling. Set aside. In a heated pan, add oil/ghee and the rest of the seasoning in the order listed under 'Seasoning'. Add the sesame seeds after the peanuts and dals are golden brown so the sesame seeds don't get burnt. Sprinkle salt and turmeric and mix well. Add the cooled rice and mix well. Sprinkle the sesame powder from step 3. Mix well, cover and remove from heat. Let the flavors blend for a few minutes. 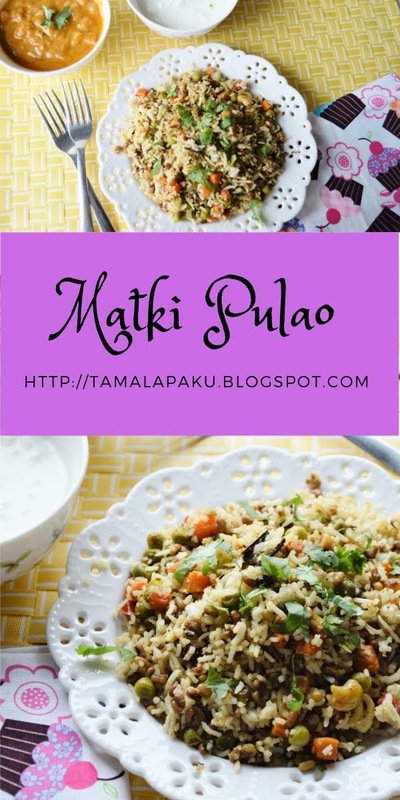 We have a protein rich pulao for today which is simple and quick to fix. The moth beans or matki beans need to be soaked for a few hours and that is the only thing which might need some planning. The simple flavors win hearts and is a perfect one for lunch boxes as well. Wash and soak Basmati Rice for 30 minutes. Cook the rice so that it is fluffy. Spread the rice in a wide platter to cool. In a heated pan, add ghee, cumin seeds, cloves, cinnamon and asafotida. Saute onions until golden brown. Add in the ginger-green chili paste. Sprinkle the dhania jeera powder, garam masala, turmeric and salt. Mix well and sprinkle water so that the spices don't burn. Add in the washed, soaked and drained moth beans. Saute and sprinkle a few spoons of water, cover and let the beans cook. After about 10-12 minutes, remove the cover, check to see if the beans are cooked well but not mushy and also the water is all absorbed. Lower the heat and add the cooled Basmati rice. Gently mix the rice into the moth beans mixture. Cover and remove from heat. Let it sit for a few minutes so that the flavor blends in. Serve in a plate and garnish with coriander leaves. It can be enjoyed with yogurt or any spicy gravy curry. 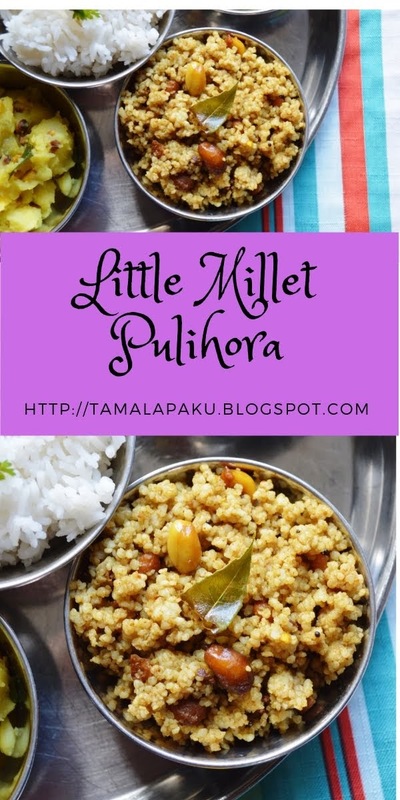 Today we have another millet based tangy preparation. This is also a breeze to prepare if the tamarind sauce is prepared in advance. I prepared this as part of a weekend meal and I shall present the whole platter in another post when the time is right :). Soak the Little Millet for 3-4 hours (Optional) and pressure cook with 1 1/2 cups of water for about 4 minutes or until cooked through and fluffy. Spread the cooked little millet in a wide platter to cool. Prepare the seasoning in a heated pan by adding all the seasoning ingredients in the hot oil. Sprinkle salt and turmeric as needed and remove from heat. Mix in the tamarind rice sauce into the cooled little millet. Add the prepared seasoning and mix well. Cover and set aside for a few minutes so that the flavors can blend in. 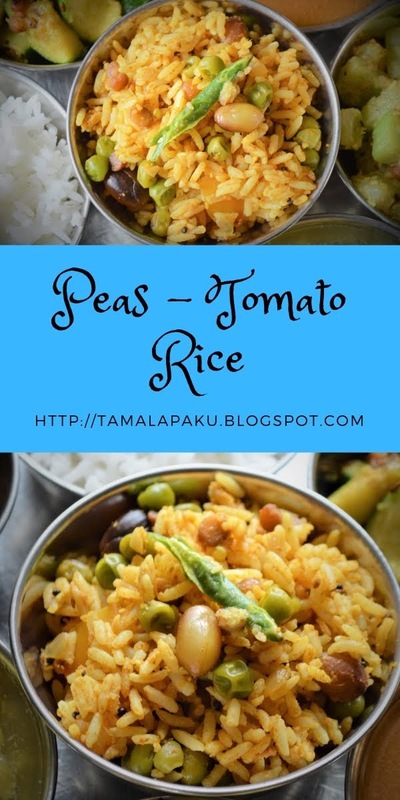 This easy, simple and nutritious rice is a quick fix meal or lunch box recipe. 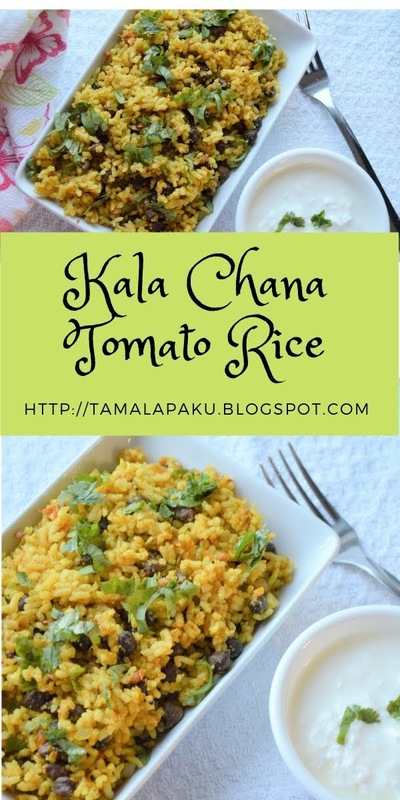 It is very convenient to make this one to finish off any leftover rice. I would typically make this rice during navratri when there would be lot of soaked kala chana at home. In a skillet on a medium-high flame, heat some oil and add cloves, cinnamon and the seasoning. After the mustard seeds start crackling, add chopped onion and saute them until golden brown. Add chopped tomato and let it cook for about 4-5 min. Add the boiled kala chana, chopped green chillies and vangibath powder and mix well. Add salt and let it cook for a couple of minutes. Remove from heat and add this mixture to a bowl with the cooked rice and mix well. Serve hot with raita or otherwise. Today we have J for Jonna or Jowar. I had requested my local grocer to procure Jowar rava a while back. On a recent grocery trip, I found there was cracked jowar on the store shelves. 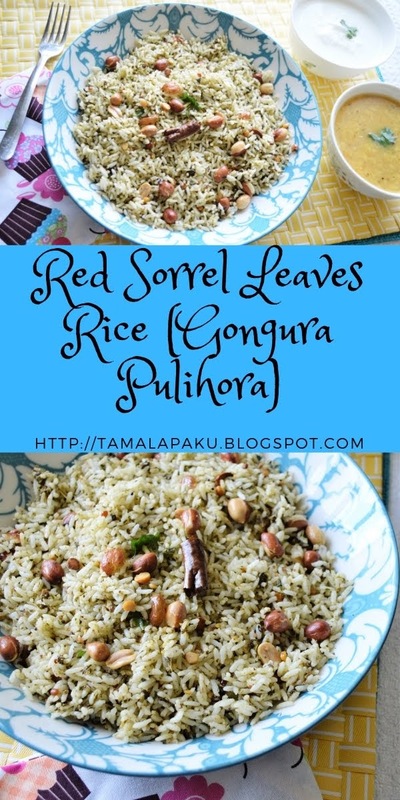 I picked them up and tried different recipes of which this pulihora was well liked at home. If the Pulihora sauce or gojju as we call it, is ready, then this dish is a breeze to prepare. *The cooking time will vary depending on how fine the grain is. I could lay my hands only on cracked jowar which was on the thicker side. Soak the Jowar Rava overnight and pressure cook with 2 cups of water for about 20 minutes or until cooked through and fluffy. Spread the cooked jowar rava in a wide platter to cool. Mix in the tamarind rice sauce into the cooled jowar rava.